Tolkien fans now have the opportunity to download the first Lord of the Rings movie, Fellowship of the Ring absolutely free from Google Play Store. 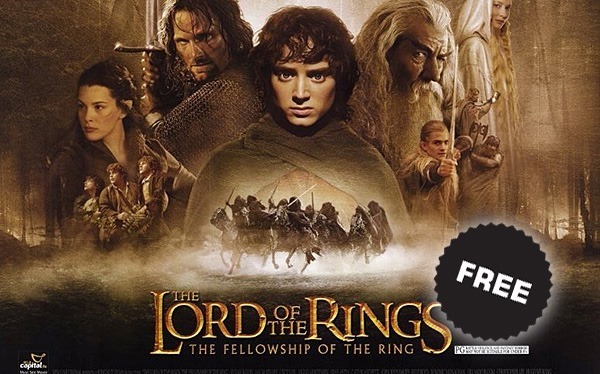 Originally available for $12.99, the movie which captured the hearts of millions, can now be grabbed for free and it’s unclear if this is a limited time offer or not. The first adaptation of J.R.R. Tolkien’s masterpiece of a novel series that is Lord of the Rings, ‘ The Fellowship of the Rings’ was released in 2001 and was critically acclaimed by many as a movie that set the tone and standard for all future fantasy films. A massive box office success, the movie earned around $871 million and was the second highest grossing cinema release of 2001, just behind ‘Harry Potter and the Philosopher’s Stone’. Incidentally this also made the film the fifth highest grossing in history at the time. With the LOTR series complete and The ‘Hobbit: The Battle of the Five Armies’ – the third installment to the prequel The Hobbit series – hitting the cinemas, Google has decided to give away the very first LOTR movie for free. If you haven’t really seen any LOTR movie as of yet, let this free download urge you to immerse yourself in the magical world that Tolkien penned down in his books in 1954, followed by Peter Jackson giving it life on the big screen. The movie has all the right elements to truly showcase how brilliant cinematography can contribute towards a stellar title. The movie showcased some of the best locations and spaces, with the brilliant soundtrack leaving behind a legacy of its own. If the name ‘Enya’ doesn’t resound in your thoughts, you really need to see this movie. ‘Lord of the Rings: Two Towers’ and ‘Lord of the Rings: Return of the King’ are currently priced at $6.99 each, a good $3 less on the original price; that is if the movie in question here manages to tickle your senses and you wish to watch the sequels. This may be a limited time offer from Google, and given it’s one of the best movies in history to go for free, downloading it straight away should be a no-brainer really. You can grab the movie from the Play Store from here. Showed me only the rental option, maybe this isn’t available in the Canadian store? The deals might be country specific – in the UK we’ve got Sherlock Holmes w/ Robert Downey Jr.